I have said it before, I am saying it now and no doubt I will say it time and time again, but the most popular tweaks in my personal opinion are the ones that provide either a much needed enhancement to the operating system or an actual real world benefit to users. Aesthetic modifications are all well and good, but tastes change over time and they will no doubt be downloaded, used for a brief time frame and then pushed into obscurity whereas a tweak or modification which provides an actual tangible benefit will stand the test of time. iOS developer Jonas Gessner seems to understand this concept and produces tweaks which offer real benefits to users of a jailbroken devices. Regular readers and jailbreakers alike may be familiar with Gessner as the developer behind the WeeKillBackground Pro, ProTube and ProTube HD offerings that live within Cydia, but his most recent tweak is now available, and is known as Currency Converter. We aren’t offering any prizes for those who guess what this tweak does as the name kind of gives it away, but in my opinion this is an extremely beneficial Notification Center widget. Continuing with the popularity of Notification Center widgets, Currency Converter plugs directly into NC to offer real time financial conversions featuring pretty much any mainstream currency you can think of. The simple but extremely attractive interface sits nicely in Notification Center and gives users the ability to type in monetary amounts and have it immediately converted between the two selected currencies using real time exchange rates which are download as and when necessary. The financial world is a complex one, and due to the fact that I regular deal with figures in US Dollars, Euros and Great British Pounds this plug in makes it simple to covert on the fly. 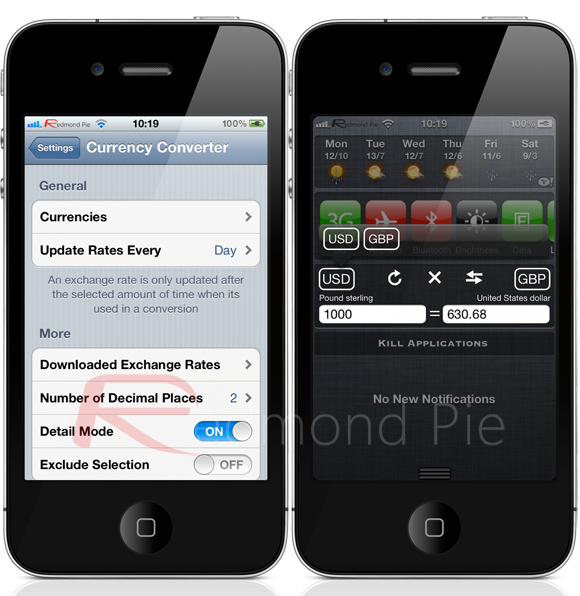 Currency Converter comes with a dedicated and comprehensive preferences panel which allows users to customize the experience to their personal tastes and includes some aesthetic options such as selected a detailed or minimalistic view as well as being able to toggle certain aspects of the tweak on or off depending on performance issues. Individual currencies can be added or removed at will through the settings entry which can then be selected via the widget itself via Notifications Center by simply tapping on the currency name which produces a nice animated overlay with the available options. All in all, Currency Converter is a very polished implementation of an idea which will provide real benefit to a lot of users. The minimalistic view will be a popular addition due to the limited space available in Notification Center but for users who require more information the detailed view may be the way forward. Currency Converter is available now from the BigBoss repository at a cost of $1.99.